The account of the healing of the demon possessed man who was blind and mute is told in Matthew 12:22-29 and Luke 11:14-15. There were exorcisms before and after Yeshua came along. Jewish historian Josephus told of one account he personally witnessed where the exorcist, Eleazar, drew a demon out of a man through his nostrils. A little ways off Eleazar would preposition a container of water that he commanded the fleeing demon to overturn letting spectators know what they witnessed was real and drawing attention to himself. 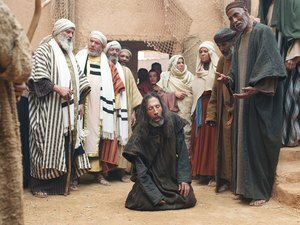 Before we go any further we must appreciate that despite thousands of fantastic miracles in his earthly ministry; with the people who received and witnessed them considering him a healer and miracle-worker Yeshua didn’t cherish that reputation. He healed those who he encountered. He didn’t do these things on command or for show. He simply served and administered to genuine human need. If there was a self-serving purpose it was to get the attention of the religious establishment that the Messiah had arrived, not to impress or enrich himself. Though there were different techniques of conducting an exorcism, some involving various techniques and potions, all required certain specific tasks. First, the exorcist and the demon had to willingly confront each other. Second, the demon’s name had to be learned because calling out a demon by name gives the exorcist the authority to command him. So a demon resisted identifying himself, making the process long and drawn out. If a demon did communicate it would use it’s victims vocal chords. But what do you do when the possessed is not only blind but mute? Nothing! No mortal could drive out a demon if the victim couldn’t speak. So this poor man in Matthew 12 and Luke 11, who was overpowered by this demon but still alive somewhere inside his own body, and anyone who knew him must have given up all hope for him; written him off as a lost cause! Only the Messiah could intervene, that is if and when he ever appears as it was foretold. Naturally, when Yeshua did come on the scene he didn’t antagonize the demon to get him to engage with him or offer his name and he didn’t put off the exorcism because it was the Sabbath either. In fact earlier that very day he healed what Matthew calls “great multitudes” in the area of all places the synagogue! No, when Yeshua encountered the demon inside that blind, mute man he just ordered him out of the man’s body and astonishingly, instantly also healed the man’s sight and voice! Imagine how mystified the crowds who witnessed it or were told of it must have been (except the Pharisees)! The people were certainly asking among themselves “Could this be the son of David?” It may have taken them a while to deduce that if only the Messiah could perform such a miracle then this, this Yeshua son of David of the town of Galilee, dressed in common robes, not kingly finery, with no crown of authority, could it be that he is the Messiah? Delitzsch Hebrew Gospels: A Hebrew/English Translation, The, Vine of David/First Fruits of Zion Publishers, 2011. Josephus, Flavius, Antiquities of the Jews, VIII, 2 sec. 5, A.D. 93-94.